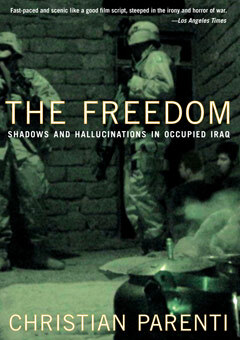 Consistently compared with the work of Hunter S. Thompson and Michael Herr, The Freedom provides a fearless and unsanitized tour of the disastrous occupation of Iraq, in all its surreal and terrifying detail. Drawing on the best tradition of war reporting, here is a rare book that “embeds” with both sides—the U.S. military and the Iraqi resistance. Acclaimed journalist Christian Parenti takes us on a high-speed ride along treacherous roads to the centers of the ongoing conflict in Fallujah, Ramadi, and Sadr City through the first year of the occupation. He introduces us to relatives waiting anxiously outside the holding fortress of Abu Ghraib and takes a night drive around Baghdad with the insurgents. He recounts the military’s use of drugs and prostitutes, the imperial buffoonery of the Green Zone, and the religious ecstasy of the Shiites. And he allows us to witness, close up and in riveting detail, the cataclysmic violence, rampant gangsterism, and quotidian heroism that is today’s Iraq.